Reach new heights and move freely with this Hyba Ultra Soft racerback tank top. 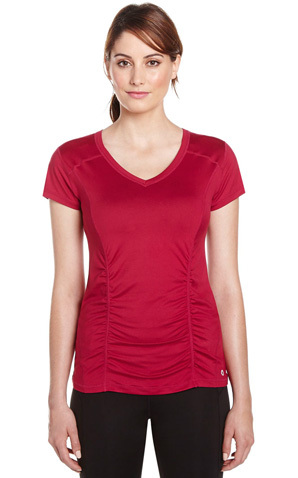 Featuring stretchy and breathable fabric and a scooped neck, it is great for any activity. Enjoy a comfortable fit that's perfect for lifting weights, doing cardio or completing a HIIT workout. The fabric is incredibly soft and lightweight. It's true to size, does not cling at the bottom, but hangs loosely, very comfortable. It's great for working out, non restrictive with your activity. I have noticed a great deal of pilling in the underarm area after a few weeks of wear. The mesh tank does not do this, but this soft tank does seem to. Not a deal breaker though, it's very comfortable for it's intended purposes. I bought the second one already! This is great for the gym, hiking, walking and great for layering. love the softness but made large. I bought a medium as I typically do (I'm a toned 5'3" w/36D bust) and it's quite lose. I'll still wear it but just wanted to let you all know.